Molex's OTS mini-lock discrete wire cable assemblies offer a 2.50 mm pitch and premium housing features. They are available in a variety of cable lengths to facilitate both prototyping and global production. Features include terminal position assurance (TPA) and positive lock, which offer secure mating and reliable connection. 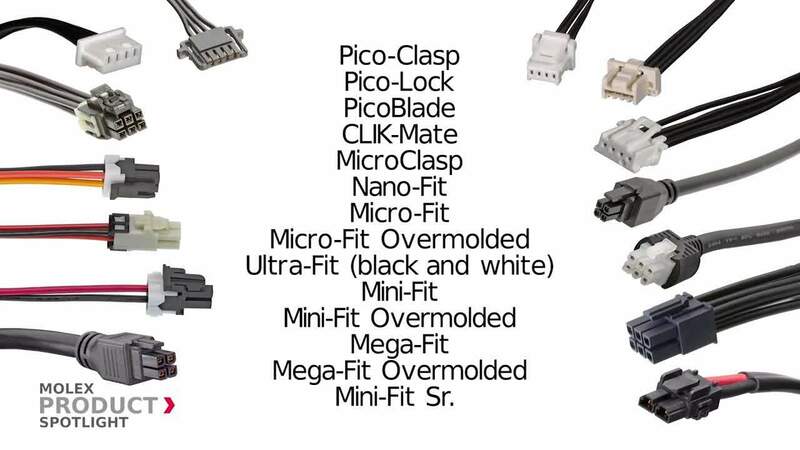 UL 1061 discrete wires for cable assemblies make these assemblies ready to use in electronic appliance applications, providing ease of design, prototyping, and production. They are assembled in ISO/TS16949 certified facilities ensuring high quality and meeting current automotive industry standards. They deliver 3.5 A per circuit with a 2.50 mm pitch. Ready off-the-shelf Molex’s cables are available in one to 15 circuit counts and 40 mm, 100 mm, 150 mm, 300 mm, 450 mm, and 600 mm lengths.